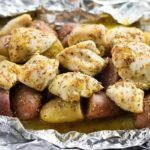 Honey Mustard Chicken Foil Packets - Juicy chicken and potatoes are cooked inside of foil packets with an easy and flavorful honey mustard sauce! This recipe is perfect for the oven or the grill. In a small bowl whisk together the honey, dijon mustard, and yellow mustard until well combined. In a second small bowl whisk together the salt, pepper, Italian seasoning, garlic powder, and onion powder. Preheat grill to medium-high heat, or preheat oven to 375 degrees. Pull off 4 sheets of foil, each about 12 inches long and spray with non stick cooking spray. Layer the potatoes and chicken evenly in the center of the foil packets. Season the potatoes and chicken with the spice mixture. Drizzle evenly with honey mustard. Fold the sides of the foil over the chicken and seal closed. Bake in preheated oven or on grill for 20-25 minutes. Chicken is done when internal temperature is 165 degrees.